1Master Student at Faculty of Pharmacy, University of Indonesia, INDONESIA. 2Professor at Department of Pharmaceutical Technology, Faculty of Pharmacy, University of Indonesia, INDONESIA. 3Professor at Department of Aquatic Products Technology, Faculty of Fisheries and Marine Sciences, Bogor Agricultural University, INDONESIA. 4Master at Department of Pharmaceutical Technology, Faculty of Pharmacy, University of Indonesia, INDONESIA. Background: Turbinaria conoides is one of abundant brown macroalgae in Indonesian oceans contains phenolic derivatives. Phloroglucinol is a multifunctional phenolic derivative in brown algae. Phloroglucinol has been known to have activity inhibitor tyrosinase, because phloroglucinol is copper chelating agent. The antioxidant and the tyrosinase inhibitor activities are parameters of the skin lightening active ingredient. The mechanism of tyrosinase inhibitors is to decrease skin pigmentation by inhibit the catalytic steps of the enzyme to the pigmentation associated with melanin production in the pathway of melanogenesis. Antioxidant activity protects skin against oxidative stress mediated by UVR. Numerous report have determine phenolic compound of T. conoides as antioxidant but none is reported as tyrosinase inhibitor. Objective: The objective of this study is to determine the activities of T. conoides as antioxidant and tyrosinase inhibitor. Methods: Turbinaria conoides were extracted with ethanol with different concentration (30%, 50% and 70%) by maceration method. 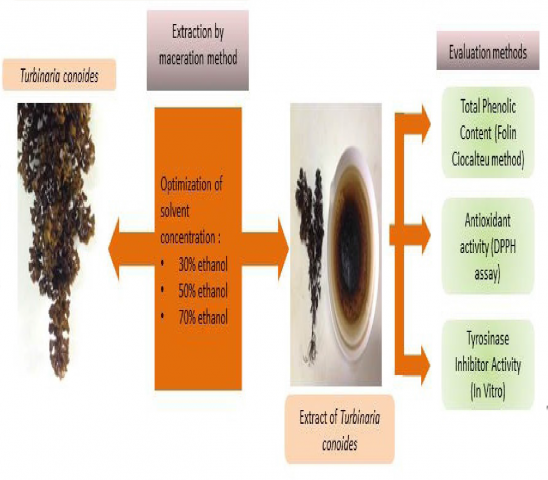 Crude ethanolic extracts of T. conoides were determined its total phenolic content, antioxidant activity (DPPH) and tyrosinase inhibitor. Results: E50 showed the highest total phenolic content (27.63±1.05 mg PGE/g extract). Antioxidant and tyrosinase inhibitor activities of E50 showed IC50 value of 215.96 μg/mL and 188.85 μg/mL, respectively. Conclusion: Ethanol extract of Turbinaria conoides is potential as antioxidant agent and tyrosinase inhibitor. Sari DM, Anwar E,, Arifianti AE. Antioxidant and Tyrosinase Inhibitor Activities of Ethanol Extracts of Brown Seaweed (Turbinaria conoides) as Lightening Ingredient. Pharmacognosy Journal. 2019;11(2):379-382.